Sixteen year old Charlize Daniels didn’t crave the limelight and relished being ignored. That until she finds herself being hunted. With no memory of how she ended up lost near her home, it was an angel face boy with an uncanny ability to disappear who saved her. Her obsession with the supernatural, one she developed after her father’s unnatural death, had her hoping her rescuer was her guardian angel. But little did she know, that couldn’t be further from the truth. With a new resolve gained after her brush with death, she no longer wanted live in the shadows. But her biggest obstacle will be to survive being hunted. Her only hope might be to remember the truth. Although the battle was won, there was no glory in the defeat. If he hadn’t been there, she might not have survived. He turned his back on the falling body of the would be killer shifting his attention back to her. His heart grew still when he saw her lips blue and her chest unmoving. He moved to her like an icy breeze, bending down to check for signs of life. He would do what needed to be done, to hell with the consequences. He hoped she would forgive what would come next. The bell rang and I reached for my backpack. I’d been to my locker before class and didn’t need to go back. I shot straight out of my seat headed out the classroom directly for the school exit. What I needed was to be outside getting some fresh air and calming my nerves. I only had a short time to complete my task. I walked straight with only a few yards until I broached the exit doors. If I could get out and away before the throngs of students gravitated to the parking lot to hang out after school, it would be a small victory. However before I could reach the exit, I felt eyes burning on the back of my head. Why I turned and looked back, I don’t know. But there, in the sea of students, milling around to unknown destinations, standing still was the fair-haired boy of my past. His green eyes and handsome looks were unmistakable. But so much had changed. I couldn’t take back the choices I made. So I broke our gaze and walked out the exit door without a word to Alex. Shannon first love was reading, diving into other realities to explore and brave new worlds. To share her writing is the best experience of all. Her first series explores the life and trials of being Mercy Moore, a teenage cambion. When Shannon isn't writing she loves to shop and watch horror movies that make turning out the lights seem like a stupid idea. Mysterious angel-faced boy? Yes, please! ♥ I'm just very addicted to that kind of story LOL! 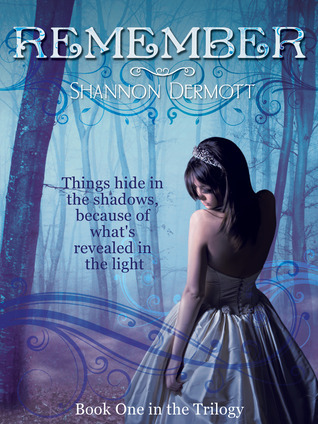 x) I heard that Shannon Dermott's books are excellent, so I'm very curious about this one too! It sounds like an enthralling read! This sounds really cool! oooh angel boy :P haha! Thanks for sharing this with us! The cover is so gorgeous, and I do like the writing in teasers, which is, of course, what I care most about. I see that you're reading Darkness Before Dawn. I'm VERY curious to hear your thoughts on that one! I love to read all your comments so please feel free to post. This is an award and tag free blog. Suzanne (Paranormal Book Fan) has read 0 books toward her goal of 145 books.